“Rownie woke when Graba knocked on the ceiling from the other side. Plaster dust drifted down from the knocking. Graba knocked again. Baskets hung on chains from the rafters, and they shook when she knocked. Rownie barely remembers a time when he wasn’t one of Graba’s many grandchildren. Before that he lived with his mother and his older brother, but when his mother drowned in the vast Zombay river, Rownie and his brother were taken under the wing of Graba, the chicken-legged witch who offers his and her other Grubs shelter. For a while now Rownie has been trying to find the whereabouts of his brother Rowan, missing since he was old enough not to be under the care of Graba. Rownie suspects that Rowan’s love of acting, which is strictly outlawed in Zombay, is to blame for his disappearance so when he encounters a group of performing Goblins he asks for their help to be reunited with Rowan. Which kicks off the most dazzling heroic adventure. This book was strange, very strange. It was exciting and fun though so I definitely enjoyed reading it and it is another 9-12 fantasy to put on my good reads list. The story was a bit odd, its steampunk, magic and adventure all rolled into one and the automations and witches were fascinating. There were some confusing parts of the story becuase things weren’t really explained properly so when there was mention of coal I had to work our exactly what it mean myself, and I’m still not a hundred per cent sure that it is what I think it is. There was plenty of magic and mayhem which I enjoyed but I think that the adventure was a little more laid back than I usually enjoy. The writing was good, but it did tend to jump around a little bit and not flow as brilliantly as I had hoped. The voice used was a good storytelling voice and I could hear the bits that flowed well in my head as I was reading. I really liked some of the characters but there wasn’t much background offered into them. I wanted to know more about the goblins and how they became who they were. This is especially true with Semele because I have ideas of who she is that I guess were implied but they were only loosely implied so I am not sure. The same can be said for Vass and I really want to know what made her so different from Graba’s other children, unless it was just because she kept her name. I really liked Rownie and Semele and Thomass though and I think that Graba herself was really intriguing too. I think the setting was what really made me carry on reading though because it seemed magical, the Bridge full of performers and the idea of a travelling band of performing Goblins, it was all fantastic. The Clock tower too and the events that happen within it was brilliant and the masks that the goblins had were really interesting too, once I got my head wrapped around them. All in all Goblin Secrets was a good, quick, entertaining enough read. I was a bit disappointed by a few things but there was enough that I did enjoy to make me want to carry on reading. I will definitely be tempted to check out more by the author and recommend to younger readers. 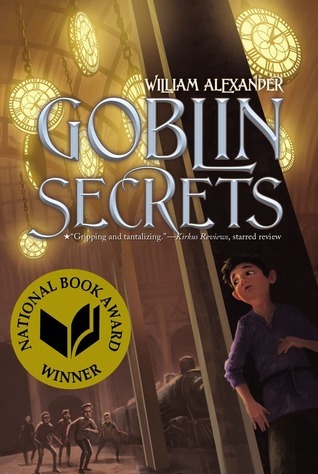 Goblin Secrets will be published on July 18th by Much in Little. My copy was sent by the publisher in exchange for an honest review.